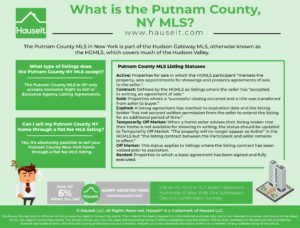 What is the New York Putnam County MLS? How do I sell my home For Sale By Owner in Putnam County, NY? How do I list my property on the MLS for a flat fee so I don’t have to pay 6% commission? 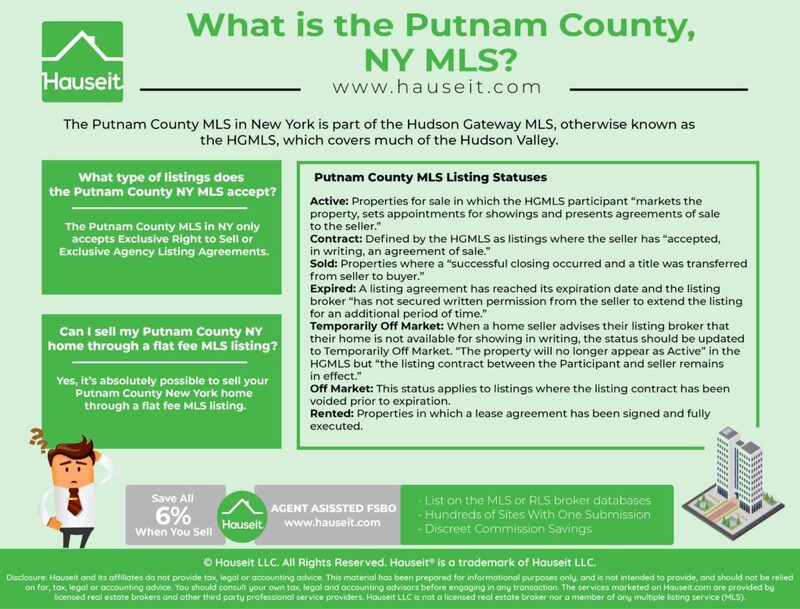 The Putnam County MLS in New York is part of the Hudson Gateway MLS, otherwise known as the HGMLS. The HGMLS is the primary MLS for and owned by the Hudson Gateway Association of Realtors. The HGMLS is the primary MLS in the greater Hudson Valley with full jurisdiction over the core counties of Orange, Putnam, Rockland and Westchester. *Going forward in this article, when we mention New York’s Putnam County MLS, it is in reference to the HGMLS. What type of listings does the Putnam County NY MLS accept? An “exclusive right to sell” listing means that if you the owner of the property, find a buyer for your house, or if another broker finds a buyer, you must pay the agreed commission to the present broker. An “exclusive agency” listing means that if you, the owner of the property finds a buyer, you will not have to pay a commission to the broker. However, if another broker finds a buyer, you will owe a commission to both the selling broker and your present broker. Open listings or listings with only a verbal agreement are certainly not allowed. This is standard across Multiple Listing Services across the country. The HGMLS does offer a template Exclusive Right to Sell Listing Agreement for its participants to use; however, our partner brokers have heard the HGMLS staff state that they are okay with other formats, including standard listing agreements from other Multiple Listing Services. In a more informal setting, the kind HGMLS staff informed our partner brokers that they simply want to make sure that Realtors actually have a right to list the property, and that they are offering some form of commission to other participants. In other words, Realtors are free to use their own listing agreement! Can I sell my Putnam County NY home through a flat fee MLS listing? Yes, it’s absolutely possible to sell your Putnam County New York home through a flat fee MLS listing. The Putnam County MLS will accept custom, flat fee listing agreements and only requires participants to list what commission is being offered to buyer’s agents! 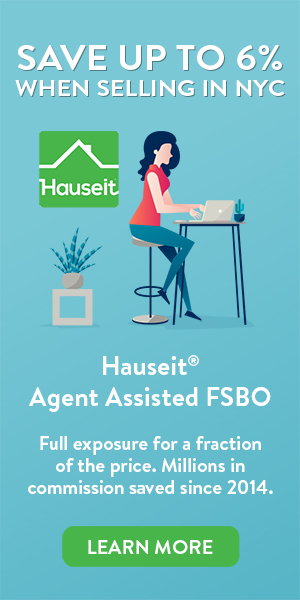 This means that other agents won’t be able to tell that you have a non-standard listing arrangement in place, especially if you are paired with one of our traditional, brand name brokerage partners! Note: You do need to offer some form of compensation to buyers’ agents, even if it is a below market amount. Remember, the whole point of listing your home on the HGMLS is to engage buyers’ agents! Insider’s Note: Matrix, which is the name of the software system agents use to access the HGMLS, has three required fields for commissions per listing: Seller/Sub Agent Comp, Buyer Agent Comp and Broker Agent Comp. However, listing Realtors only need to put in a non zero number in one of the fields. They are free to put zeroes in the other two fields. As a result, most HGAR agents only list a commission in the field for “Buyer Agent Comp” and leave the other two fields as zero. This is very important because it ensures that other agents won’t know that you aren’t paying full commission to your listing broker! In fact, there’s no way for other agents to determine what our partner brokers are being paid! Furthermore, even though a listing agreement must be uploaded into Matrix within 24 hours of execution, it can be set to private so that only the HGMLS staff is able to view it. It’s extremely important to update your listing status so we can notify our partner brokers when your property has an accepted offer, goes into contract and gets sold. Failure to update a listing’s status in the HGMLS can result in hefty, automatic fines that get passed onto you! Active: Properties for sale in which the HGMLS participant “markets the property, sets appointments for showings and presents agreements of sale to the seller.” In this status there can be no agreement of sale currently in effect. Temporarily Off Market: This is an important one when your home is not available to be shown. When a home seller advises their listing broker that their home is not available for showing in writing, the status should be updated to Temporarily Off Market. “The property will no longer appear as Active” in the HGMLS but “the listing contract between the Participant and seller remains in effect.” New listings must be available to be shown to all HGMLS subscribers the moment it is entered in the HGMLS database. If the seller has given instructions “to the contrary, the property must be status TOM until” it is available to show. The HGMLS requires the submission of the seller’s written instructions, including the date the property will become available to show, with the listing agreement. Participants can return the listing to Active status with written permission from the owner. Rented: Properties in which a lease agreement has been signed and fully executed. Listing Extensions: If you wish to extend your listing, you’ll need to sign an Extension Agreement. This agreement must be uploaded into the HGMLS within 60 days of the expiration of your listing agreement, otherwise a new listing agreement, MLS number and upload will be required.